Keto Mustard Pork Casserole Recipe - "Low-Carb Stew" - Mild & Creamy! 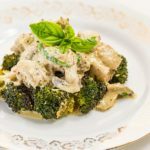 Our Keto Mustard Pork Casserole recipe is a tasty winter warming dish, bursting with delicious flavors. It's a winner around the dinner table, everyone loves the "Tangy & Creamy" sauce. Place a large saucepan over medium heat and add the butter, onion, thyme and salt. Saute for 5 minutes, until the onion is beginning to turn translucent. Add the diced pork and cook for 5 minutes, until the pork has started to color. Add the seeded mustard, chicken stock and sour cream and bring to a simmer. Simmer for 20 minutes before adding the mushrooms. Stir well. Continue to simmer for 40-60 minutes, until the pork is tender and the sauce has thickened. Remove from the heat, add the fresh basil and stir through.